PLAJA is an association for Long term stayers in Phuket. We provide valuable services for members who are living or are going to stay in Phuket. PLAJA is a friend, family and neighbours who share a belief that community what we make it. We live in an age of globalization. Number of long stayer (Long term stay or immigrate) abroad is annually tendency increases. For example about Japanese, it is accounted for about 27% of the total Japanese for long stay in Asian region in recent years. Especially Thailand among the asian countries, there is less risk such as the China shock, Japanese manufacturers are steadily increasing. Consequently Japanese residents number expansion is about 4% of the total and led to about 15% in the Asia region there. However, the increase in Japanese long-term residents concentrated in the capital Bangkok because of the Japanese companies advance. the number of Japanese to long-term stay has remained about 600 people (2013 currently). There are differences by area. Among them about 60 people elderly who are receiving a pension has been a long-term stay in Phuket. Problems that the middle aged and elderly facing. Although various problems and challenges due to aging is where it is widely known, there are also problems of language and lifestyle in order to live in local. Additionally public transportation is not fully developed yet. It should assume corresponding when they encounter an accident because it is increased frequency of driving their own vehicle. In case of sick or injured, otherwise the death in hospital or outside. They are living with lots of worries. Organization that support the migrants. 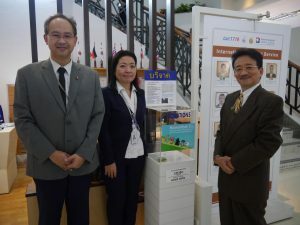 There was no association which supports worries or troubles especially for elderly people in Phuket. Under such a circumstance, PLAJA was started in 2011 by 10 volunteers in order to ensure their own safety and security. To support for members safety and security, PLAJA set up the installation of safety measures division for members. – Implementation of health diagnosis. – Creating and distributing PLAJA emergency card. – Build a system that prepares the reception desk for emergency call and rush over to the scene/ place. – Creaet SOS report apps on smart phone. – Implementing the proposed activities of the living environment of members. Community to live in the field. There are Bicycle club for health promotion, Language lesson (English / Thai), Thai cooking class, as activities. And, an association that care of the Indian Ocean tsunami victims memorial monument and organize the memorial service every year. but also necessary to have communication with local to get valuable information from intercultural exchanges. to support activities to the orphanage and other activities to the local kendo club has led to international exchange. pass on the lesson of the tsunami to the future generations and represent the memorial to the victims.